Speaking from the Pentagon Monday morning, President Trump gave remarks to a crowd of soldiers, victims, family members and first responders to commemorate the 16th anniversary of the September 11 attacks. It was his first 9/11 anniversary address as commander-in-chief. "This is an occasion that is extraordinary and it'll always be extraordinary," Trump said. "Today our entire nation grieves with you and with every family of those 2,977 innocent souls who were murdered by terrorists 16 years ago." "On that day not only did the world change but we all changed. Our eyes were opened to the depths of the evil we faced," he continued. During his remarks, the President repeatedly acknowledged the enemy America still faces and vowed to pursue evil in every corner of the world. "In the years after September 11th, more than five million young men and women have joined the ranks of our great military to defend our country against barbaric forces of evil and destruction. American forces are relentlessly pursuing and destroying the enemies of all civilized people, ensuring, and these are horrible, horrible enemies, enemies like we've never seen before," he said. "But we're ensuring they never again have a safe haven to launch attacks against our country. We are making plain to these savage killers that there is no dark corner beyond our reach, no sanctuary beyond our grasp, and nowhere to hide anywhere on this very large Earth." The President highlighted the heroic efforts of first responders and U.S. servicemembers who have given the ultimate sacrifice. He told the story of a Pentagon police officer who saved 20 people from the rubble the day of the attack. "On the morning of 9/11, Pentagon Police Officer Isaac Ho’opi’i and, a special person, was one of many heroes whose love for his fellow Americans knew no bounds. He was a mile away when he got the call over his radio that a plane had crashed into the Pentagon. He sped to the scene and raced into smoke and fire. Few people would have done it. He ducked under live electrical wires and trudged through puddles of jet fuel only steps away from sparks and from vicious flame," Trump said. "In the pitch black, he began calling out people in need of help. Isaac heard faint voices and he wanted to answer those faint voices. One by one, he carried people out of the burning rubble. He kept going back into the smoldering darkness, calling out to anyone who could hear, anyone who was alive. He saved as many as 20 people who had followed his voice; he carried eight himself." 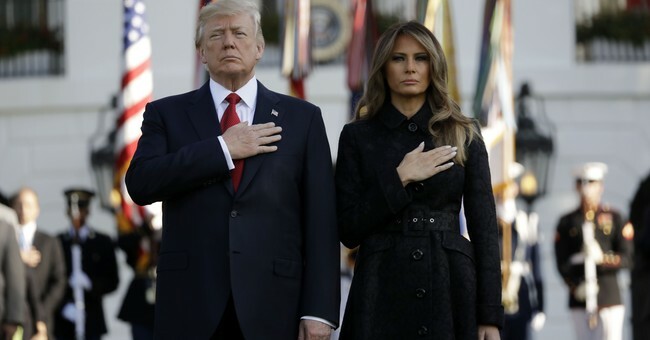 Early this morning, the President and First Lady took part in a moment of silence marking the time when the first plane hit the World Trade Center in 2001. Vice President Mike Pence delivered remarks in Shanksville, Pennsylvania Monday morning to commemorate the crash of Flight 93.